What was that scientist thinking when he chose scissors as a viable alternative to fingers? Sure, you can do plenty of cool things with scissors for fingers. Styling hair, trimming the hedges and cutting construction paper comes naturally, but things like eating without poking yourself in the eye, combing your hair, and high fives become a real drag. It's still better than having chainsaws for hands like Timmy Chainsawhands from the castle down the block. We digress. What we mean to say is that having scissors for hands is actually pretty cool, and anytime you can wear scissors as a fashion statement is sure to be an excellent time. Even if it may make things like zipping up a jacket or pants a little difficult, they look cool enough to more than make up for the small inconveniences. Ah, the things we sacrifice in the name of fashion! 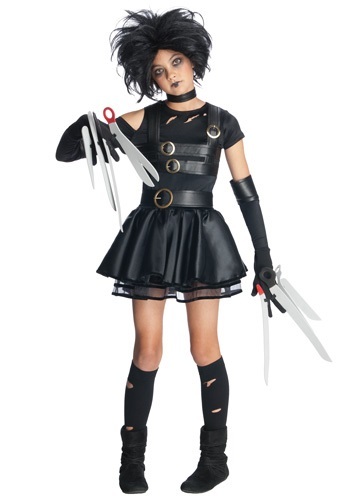 If she's ready to give some extra sharp hands a try, this officially licensed teen Ms. Scissorhands costume will have her ready for a night on the town! The black polyester costume dress has a three-quarter-length sleeve and one short sleeve and features gold-tone buckles for added detail. It comes with the wig included, too, so she can get the hairstyle that's looks just like the one the original Edward Scissorhands Sported. And, of course, this ensemble includes the best, too, the pair of black gloves that have polyfoam scissor knives attached to each finger. That's sure to have her feeling extra sharp!